Bulletin of Economic Theory and Analysis uses American Psychological Association (APA) 6.0 th ed for citations, footnotes and reference list. Manuscripts should be prepared according to APA, 6th ed., except for the additional requirement of numbering the sections, as described below. This is a sample of the format for A4-sized pages (21 x 29 cm) with left, right, top and bottom margins of 2.5 cm. Use 12 pt size Times New Roman with 1,5 space. The first line of each paragraph should be indented 1.25cm. The title of the paper should be written to header on the left side of the paper and the page number should be written to right header. The manuscript should be structured as; the title of the paper, abstract, key words, JEL codes, introduction, methodology, results, acknowledgements, references and appendix. It is written on the first page of the manuscript. Title should not exceed 12 words or contain abbreviations. Title should be written centered and first letter of the words capitalized. In the below the name of the authors should be written without academic title. The affiliation of the authors should be written as a footnote left-aligned. The footnote contains institution of author, funding of study if it is supported by project and e-mail address of the writer(s) for communication. The abstract should not exceed 200 words. Manuscripts in Turkish should have both Turkish and English abstracts with English title. The abstract should contain the aim of the paper, methodology, findings and results. The first page of the manuscript should consist of Turkish-English title, abstract, at least three, at most five key words and JEL (Journal of Economic Literature) codes. Key words and JEL codes should be written italic and indented 1.25cm. Equations should be written right aligned and consecutively ordered. Do not use images as equations. Tables and figures should be in their actual positions in the paper, not placed at the end or on separate pages. Tables should be numbered consecutively and the title of table should be placed under the name of the table. Notes should be written end of the table and centered. Figures should be numbered consecutively and the title of figure placed under the figure and justified. Notes should be written after title of the figure. Figure 1. Public Debt/GDP the term of 2005-2016. Adopted by EUROSTAT. Indented, boldface, italicized, lowercase heading with a period. Begin body text after the period. Eichengreen, B. J. (1998). Globalizing capital: a history of the international monetary system. Princeton University Press. Snowdon, B., & Vane, H. R. (2005). Modern macroeconomics: Its origins, development and current state. Cheltenham, UK: Edward Elgar Publishing. Krugman, P. R., Obstfeld, M., & Melitz, M. J. (2012). International economics: Theory & policy. Boston: Pearson Addison-Wesley. Frank, R. H., & Bernanke, B. (2004). Principles of economics (5th ed.). Boston, MA: McGraw-Hill. Granger, C. W. (Ed.). (1991). Modelling economic series: Readings in econometric methodology. Oxford: Clarendon Press. U.S. Department of Labor, Bureau of Labor Statistics. (1993). Labor composition and U.S. productivity growth, 1948-90. Washington, DC: Author. Bai, J., & Kao, C. (2006). On the Estimation and Inference of a Panel Cointegration Model with Cross-Sectional Dependence. In B. H. Baltagi (Eds. ), Panel Data Econometrics - Theoretical Contributions and Empirical Applications Contributions to Economic Analysis(pp. 3-30). Amsterdam: Elsevier. Baltagi, B. H. (2009). Econometric analysis of panel data. Retrieved from Wiley. Bai, J., & Kao, C. (2006). On the Estimation and Inference of a Panel Cointegration Model with Cross-Sectional Dependence. In B. H. Baltagi (Eds. ), Panel Data Econometrics - Theoretical Contributions and Empirical Applications Contributions to Economic Analysis(pp. 3-30). Retrieved from Elsevier. Saks, R. E. (2008). Job creation and housing construction: Constraints on metropolitan area employment growth. Journal of Urban Economics, 64(1), 178-195. Retrieved from ScienceDirect. Murphy, R.O., & Ackermann, K.A. (2013). Explaining behavior in public goods games: How preferences and beliefs affect contribution levels. Manuscript submitted for publication. Aksoy, E. E., & Uğurlu, E. (2013). The effects of the 2007-2008 financial crisis on Turkish firms. 10th EBES Conference (pp. 233-241). Istanbul: EBES Publications. Şenesen, Ü. (1986). A macroeconometric model for the Turkish economy. Paper Presented at the World Conference of Applied Econometric Association, Istanbul, Turkey, 01 May 1986. Ugurlu, E. (2006). Real exchange rate and economic growth: Turkey (Unpublished master’s thesis). Istanbul Technical University. Table 4. 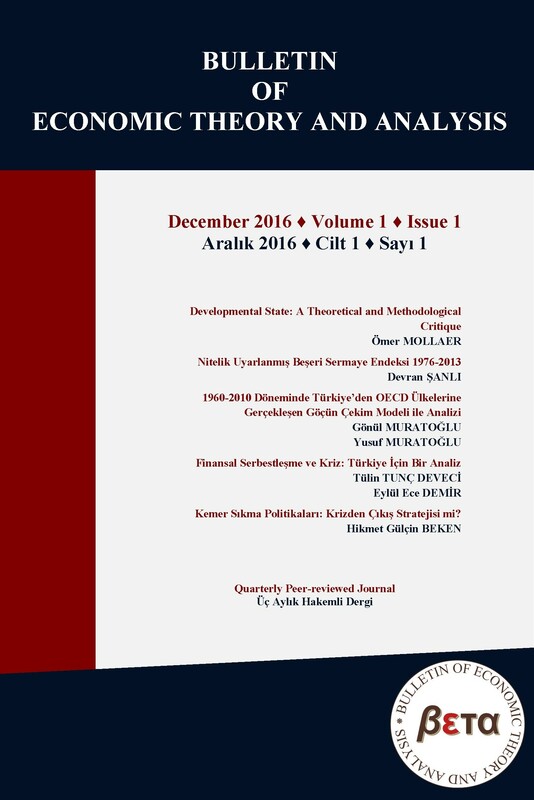 Uyarlandığı yer “Foreign direct investment, investment agreements and economic development: Myths and realities,” by Y. Akyuz, 2015, Ekonomi-tek International Economics Journal, 4(1), 1-47. Copyright 2015 by Ekonomi-tek International Economics Journal Adapted with permission. Akyuz, Y. (2015). Foreign direct investment, investment agreements and economic development: Myths and realities. Ekonomi-tek International Economics Journal, 4(1), 1-47. Figure 8.1. Uyarlandığı yer Longitudinal and panel data: Analysis and applications in the social sciences, p. 305, by E. W. Frees, 2004, Cambridge, UK: Cambridge University Press. Copyright 2004 by Cambridge University Press. Reprinted with a permission. Frees, E. W. (2004). Longitudinal and panel data: Analysis and applications in the social sciences. Cambridge, UK: Cambridge University Press. All or part of a table, figure, or data used in text: From the Web. Note. The data in column # are from External Debt : Use of IMF credit (Million $), Turkey, Oct 2016, Turkish Statistical Institute. Copyright 2016 by TUIK. Reprinted with permission.